Rating: 5.0/10. From 56 votes. 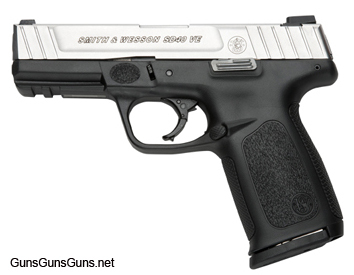 Summary: The description, specs, photo, pricing and user ratings for the Smith & Wesson SD40 VE pistol. The Smith & Wesson (S&W) SD40 VE pistol is built on a black polymer frame with a stainless slide and barrel and chambered in .40 SW. This VE model is slightly different than S&W’s original SD40 model. Reportedly, with the VE the company has removed some of the premium features found on the original to lower the price. Features removed include the melonite finish on the slide (it’s now stainless) and the tritium night sights (the VE offers a standard white three-dot arrangement). Note: S&W now offers a California-compliant version of this pistol, the SD40 VE CA Compliant. This model includes a tacticle loaded chamber indicator and a 10-round-only magazine. .40 SW 14+1, 10+1 7.2″ 4″ 1.29″ 22.7 oz. This entry was posted in .40 SW, $251-$500, Full size, Semiauto, Smith & Wesson on June 12, 2012 by Staff. While trigger is stiff (after all it has no manual safety) it is a great value gun. This is the worst gun Ive ever handled. My brother bought one because they were cheap ($280, at Academy) had alot of firepower, and the salesman said it was just like a glock. It turned out to be wildly, dangerously inaccurate. Im talking about missing man sized targets altogether at 7 meters! It did at least cycle reliably, in that way it was like a glock, and also in the ergos (which I dont like) and painless takedown. It felt chintzy compared to a glock though, and some how had an even worse trigger. This is one of very few guns Id say to avoid. Ive seen new 4″ XD9 out there at $350, and would highly recommend saving up the extra money and going that route, if you want a fullsize polymer/striker handgun. If you absolutely can spend no more than $280 on a weapon, Id recommend the rossi 357 snubby academy sells for $260. Can not reccomend buying this gun.